An incredible 465 days had passed since the midfielder had finished a top-flight clash on the losing side. Paul Pogba was a frustrated man tonight. 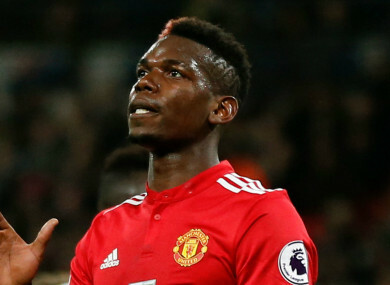 PAUL POGBA WAS sent crashing back to earth with that rarest of occurrences: a defeat in the Premier League wearing the Manchester United shirt. The France international was powerless to avoid a 2-0 reverse at the hands of Tottenham on Wednesday, with Phil Jones putting past his own keeper after Christian Eriksen opened the scoring just 11 seconds into the game. Amazingly, it is the first time that Pogba has finished on the losing side of a Premier League game for over a year. No less than 465 days had passed since United’s last defeat with Pogba on the pitch, a 4-0 drubbing against Chelsea on 23 October, 2016. Since then the Red Devils had managed 23 wins and 13 draws with their midfielder in a total of 36 unbeaten matches. The game also marked only the second time in 87 games that United have lost a match by more than a single goal. United youngster Marcus Rashford was a notable absence at Wembley, sitting out the encounter as Alexis Sanchez was given his Premier League debut. Rashford failed to feature for the Red Devils for the first time since 2016-17′s final match against Crystal Palace, when manager Jose Mourinho took the opportunity to blood several youngsters. But the England international might find himself back in contention after the United attack failed to overcome Spurs’ stiff resistance in a damaging defeat. Email “Paul Pogba tasted Premier League defeat for first time in over a year tonight”. Feedback on “Paul Pogba tasted Premier League defeat for first time in over a year tonight”.